Activists with Port Militarization Resistance have brought a lawsuit against an agent provocateur who infiltrated their group and the military and law enforcement involved. Wholesale spying on the population — once mostly the elusive dream of militantly venal, addled or power-hungry despots — has rather abruptly gone mainstream. On top of everything else we owe Edward Snowden, his disclosures confront us with an uncomfortably clear-eyed take on the rapidly emerging architecture of total dominance — or at least as clear-eyed as it can be, until the next spate of revelations widens the aperture even more. While the nakedly Orwellian power-plays proceed apace in the shadows of Guantánamo Bay isolation and the systemic stampede of mass incarceration, virtually all of us are being swept up in the dragnet abetted by wired convenience as governments and corporations comprehensively trawl our email, apps and the length and breadth of our real and virtual lives for data. We’re just beginning to get our bearings as the news finally sinks in that comprehensive, real-time profiling of all of us is now standard operating procedure, delivered mostly not with the poised truncheon but the microbot embedded in Angry Birds. But even in this time of indiscriminate corralling of the nation’s data — or the use of online operations to upend and discredit one’s opponents — there is still the old-fashioned retail approach: slowly developed entrapment and sting operations launched against those resisting government policy. Such activity came to light again this week with the revelation that surveillance and dirty tricks designed to infiltrate and undermine a nonviolent activist group based in Olympia, Wash., was much more extensive than previously thought. 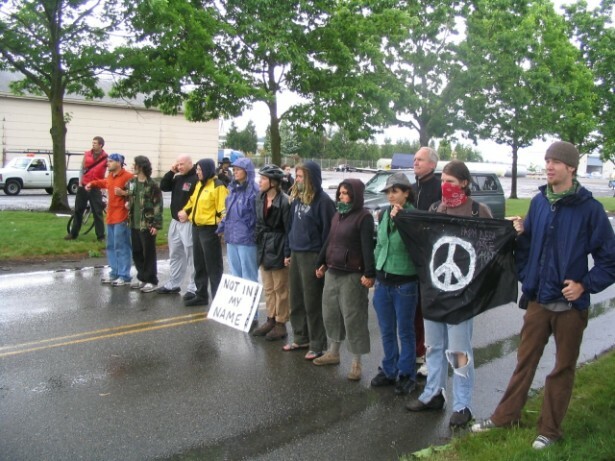 The Port Militarization Resistance, or PMR, movement organized nonviolent action aimed at peacefully blockading shipments of weapons from Fort Lewis military base — later renamed Joint Base Lewis-McChord — to Iraq and Afghanistan from ports in Olympia and Tacoma. ( Numerous actions took place between 2006 and 2009, including a 2007 nonviolent blockade in which activists were pepper-sprayed by police.) In 2009, it was discovered that one of the PMR activists was, in fact, a soldier at Ft. Lewis. Known in the movement as John Jacobs, John Towery was a member of the U.S. Army’s Force Protection Service who actively spied on PMR and Iraq Veterans Against the War. At the time, officials at the base distanced themselves from Towery, suggesting that he was acting alone and without authority. Even at the time, however, activists who talked with Towery stated that he had admitted to passing information about the groups he spied on to an intelligence network that included municipal, state and federal agencies. Activists say that Towery at the time also revealed how Tacoma police had set up a surveillance camera trained on an activist meeting place. Towery, the military and a number of law enforcement agencies are now co-defendants in a lawsuit brought by members of PMR and others. As Democracy Now! reported this week, documents obtained as part of this litigation reveal that Towery was less a rogue operative than someone building a multi-agency spying apparatus over the course of several years, which seems to dissolve the plausible deniability that Towery’s superiors claimed. There is also some evidence that Towery allegedly attempted “to entrap at least one peace activist… by attempting to persuade him to purchase guns and learn to shoot,” apparently as a way to undermine the group’s commitment to peaceful change. We are encouraged by the fact that in the end the target of this psychological operation firmly shut the door of violence. This long-term snooping operation, which seems to have been compounded by a sting operation, not only represents a fundamental violation of constitutional rights, it may have violated the Posse Comitus Act, which was first passed in 1878 to create a clear division between the military and domestic police forces in the United States. In light of the comprehensive surveillance with which virtually all of us are bombarded daily, such methodical, person-to-person undercover snooping and dirty tricks comes off as almost a quaint throwback to an era before wholesale digital fishing and, in some parts of the world, mercilessly dehumanizing drone strikes was commonplace. Not only does it seem passé, it also — as in this case — risks exposure. You’d think that the government would stick to the mass vacuuming of citizen information that, we now know, is so in vogue today. Maybe, but it’s hard to believe. A government accomplished in keeping tabs on resistance movements in earnest since at least World War I knows the value of the personal touch. Getting up-close can offer a much surer grasp of the soul of an organization, not simply information on its tactics and logistics. Moreover, the potential for monkey-wrenching from the inside increases exponentially with an informant roaming around in the midst of the movement and not simply gazing at it from across the street or from across the country. An agent provocateur can veer a campaign from its path of peaceful social transformation onto the slippery slope of violent tactics that often plays into the hands of the government by typically delegitimizing the movement and justifying the authorities in hammering it. Yet such operations are costly. Clearly there’s a cost-benefit analysis in play when contemplating how to surveil and control domestic dissent. The intelligence bureaucracy likely hopes that most of this can be achieved through massive electronic spying. Although years from now we may find that the use of infiltrators to keep tabs on and disrupt political movements has been widespread, it is more likely that they will increasingly be deployed in cases where nonviolent action shifts from symbolic political expression to actual nonviolent interference with military objectives, like movement of weapons and troops from point A to point B. This may be where the government concentrates its attention and action. To which I would say — no matter. If we maintain a determinedly nonviolent spirit, we are simply helping to expose what’s what, and helping our larger society make a choice. In fact, there is a range of choices. First, do we really want to spy on nonviolent protesters, given the principles of the right of assembly and dissent that are at least on the books? Second, do we want to simply let the means of war pass benignly through our communities? It turns out that the peace movement was right, for example, to object to a war in Iraq based on false justification — no weapons of mass destruction, no connection with Al-Qaida — and so it was right to try to stand in the way of its machinery. In sizing up these questions, it is clear that nonviolence is not only a tactic or strategy, but a spirit which our culture is in sore need of — a spirit of free political engagement, a spirit searching for peaceful solutions to complicated problem beyond war, and a spirit that takes seriously the hard won lesson that “good for the greater good” is ultimately a better way to go. Even though the Army informants of the world, and the system behind them, may object, we — like those at PMR — can shut the door of violence and bring a more open and effective power to bear.